As I’ve continued to write this Syrah blog over the last year and a half, I’ve come to realize that there are basically two reasons why a winemaker makes Syrah these days. One is that they just happened to come across some high quality fruit that they can get for cheap and they decide to take a chance on it. The other is that they have passion for Syrah (usually connected to some time spent in the Northern Rhone) and they believe that it can be made in California in a way that is true to its roots. Usually, not always, the wine from the latter group is better than the former, and indeed, that is the case with Kieran Robinson Wines. On first opening, Le Voyageur had aromas of coffee and red fruit and was definitely more of a cool climate style than the ’09. Bright strawberry and coffee led to a core of acidity that I could smell in the glass. The palate was bright but not unforgiving with a nice dry finish. Very little oak present. I let the wine sit on the counter for a day (as I usually like to do) and by the next day the wine really blossomed. I got more fruit aromas to accompany the strawberry of dark cherry and plum, mixed with savory aromas of tobacco, leather and aged beef. Those tobacco aromas carried over into a rounder, richer mid-palate, and the finish still had a good punch of acidity without any hint of alcohol. This wine just screams Syrah. It’s almost a perfect Syrah for me, with that balance of richness and acidity that creates such a beautiful tension. It’s such a varietally correct Syrah and the second one I’ve tried from Bennett Valley that just tasted so French to me. In both instances the wine was made by winemakers who had lived in the Northern Rhone. Kieran’s stint in the Northern Rhone came after a harvest job in the Finger Lakes region in New York that stoked a budding fire for all things wine. He moved to France with his wife Kristie and worked for Pierre Gauillard who, along with François Villard and Yves Cuilleron, is part of the famed Les Vins de Vienne portfolio which is responsible for rejuvenating parts of the Northern Rhone. Kieran learned a lot during that time and brought back to the United States a love of Northern Rhone Syrah. He ended up working for Paul Hobbs in Sonoma and then took a job at Adobe Road Winery in Petaluma as assistant winemaker. He made his first two vintages of Kieran Robinson wines at the facilities at Adobe Road. He then moved on to his current job at Jericho Canyon Vineyard in Calistoga where he is working as Assistant winemaker with Consultant Winemaker Aaron Pott and Michel Rolland. He has continued making his own wine while holding down his full-time job at Jericho Canyon. 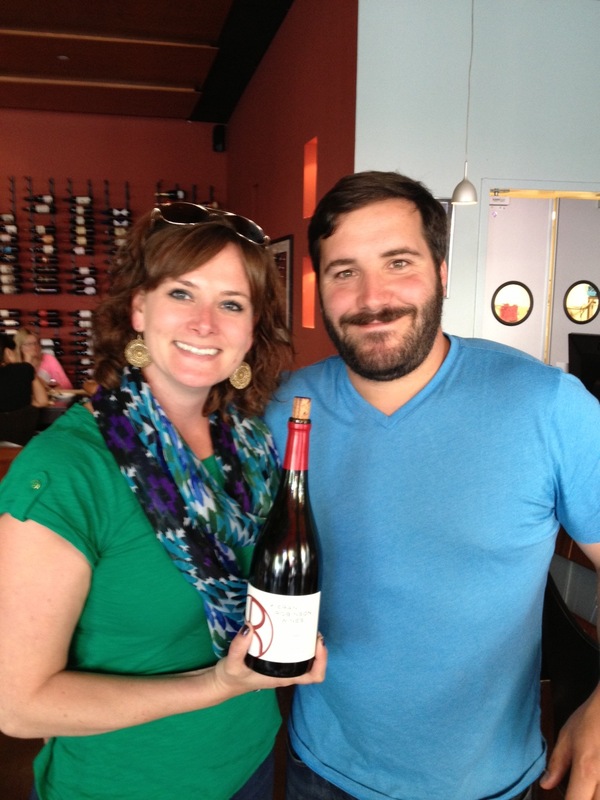 His wife Kristie is co-owner in the winery and shares Kieran’s deep love of Northern Rhone Syrah. 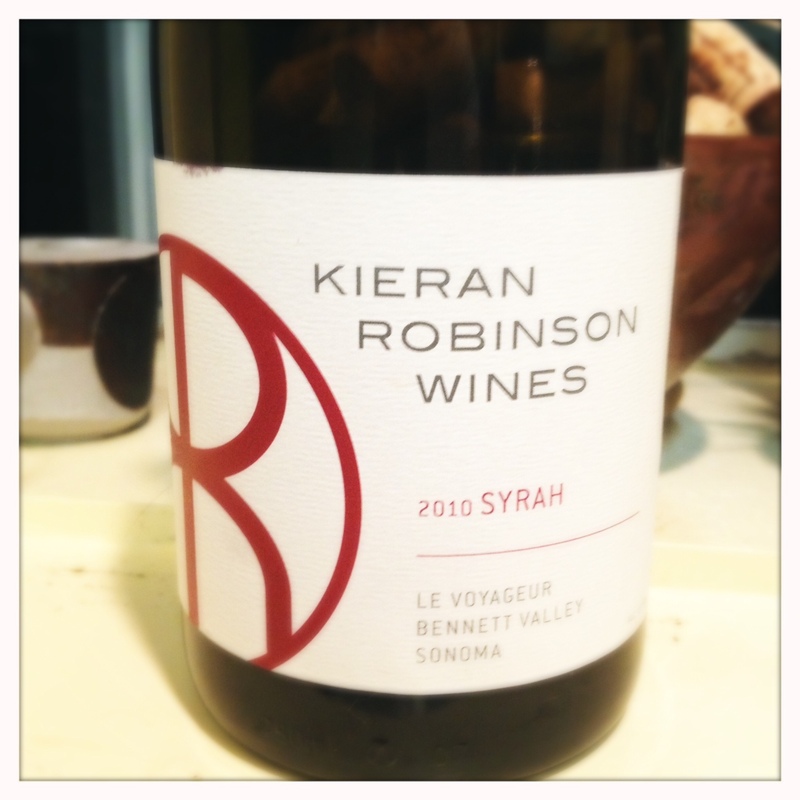 Kieran makes his Syrah in a hands-off style — he used native yeasts and tries to keep the oak treatment to a minimum. There’s no added acid in this wine either. After having trained under Paul Hobbs, Kieran isn’t exactly afraid to make additions to the wine if it makes it better, but in the case of this Syrah and this vineyard Kieran doesn’t feel any additions are necessary. I couldn’t agree more. This is Syrah from a vineyard that speaks in the language of the old world. There’s no need to mess with it. On a recent visit to Bedrock Wine Company the winery was abuzz in activity. 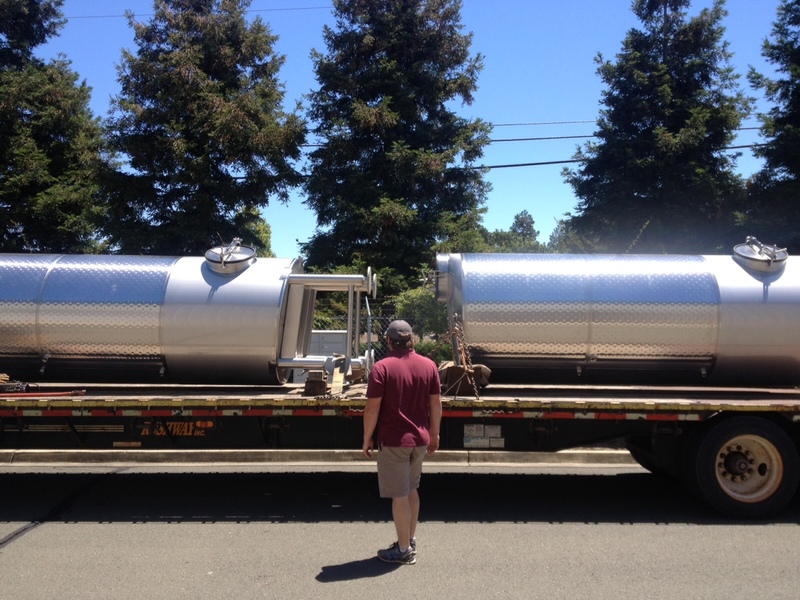 The day that I visited partners Morgan Twain-Peterson and Chris Cotrell had just received a couple of huge new tanks and were busy trying to get them off the truck and get them installed in their new winery space. The building of a winery and the upcoming harvest and vineyard visits were clearly keeping these two guys occupied. The following day, when Chris had a moment we met over at the Patz and Hall warehouse across the street from the new winery location and tasted through the impressive amount of Bedrock 2012‘s. Bedrock has been expanding exponentially in recent years and has been renting storage for their barrels from Patz and Hall on 8th street in Sonoma. As Chris and I zoomed around avoiding forklifts, it became pretty obvious that Bedrock is in need of its own digs. Chris was working fast; he’s a bundle of energy and he’s very excited about the wines that he and Morgan are making. He spoke effusively about all of them and of course was extremely happy (as is seemingly every other winemaker on the west coast) about the 2012 vintage. The excitement was warranted. The ‘12s in barrel were tasting great. We started with some Zins which although usually not my thing were actually pretty darn great. My favorite was the Kirschenmann Vineyard Zinfandel from the Mokelumne River valley in Lodi. This was a cooler climate Zinfandel at its best. Chris said that the cooling fog settles into the valley in the mornings and evenings and the grapes, because they are grown in the sand of the old river banks, have an extremely low pH which creates a pretty and elegant Zinfandel coming in at about 14.2% alcohol. The Contra Costa Evangelho Zinfandel was another favorite, light on it’s feet with an earthy core. Another wine grown in sand with 40 foot dune banks surrounding it. The barrel samples of Syrah that Chris poured for me were also tasting really well. The Kick Ranch Syrah from a bit warmer site wasn’t exactly my style but was a good warmer climate Syrah. The ’12 Griffins Lair with 8% Viognier was tasting especially well with a rich mid-palate, an elegant nose and a great lift of acidity on the finish. Morgan’s Hudson S Block and T Block Syrahs were both delicious. In 2012 they will be bottled separately and not blended together as they were in ’11. The S was a meaty and brawny style but had an elegance that I liked. The T was an even more brawny and tannic style of Syrah, if a tad more juicy. Then there was the Alder Springs. I’ve had a couple of Alder Springs Syrahs but they’ve tasted a tad warm-climate to me and I expected this to be the same. Not so. This wine had cool-climate Syrah written all over it. What a delicious and pure Syrah. The nose was floral and meaty with pepper at the same time. The mid-palate was rich and full but with huge tannins on the finish. This was a wine that definitely needed some more time in the barrel to balance out the tannins but I can’t wait to taste it upon release. Or maybe a few years after. These were remarkable Syrahs and they speak to the quality of the ’12 vintage. As we traversed across the vast warehouse from barrel to barrel I couldn’t help thinking that these guys are making a lot of wine for just the two of them. I can see how they are so busy. This is a lot of work for two guys. 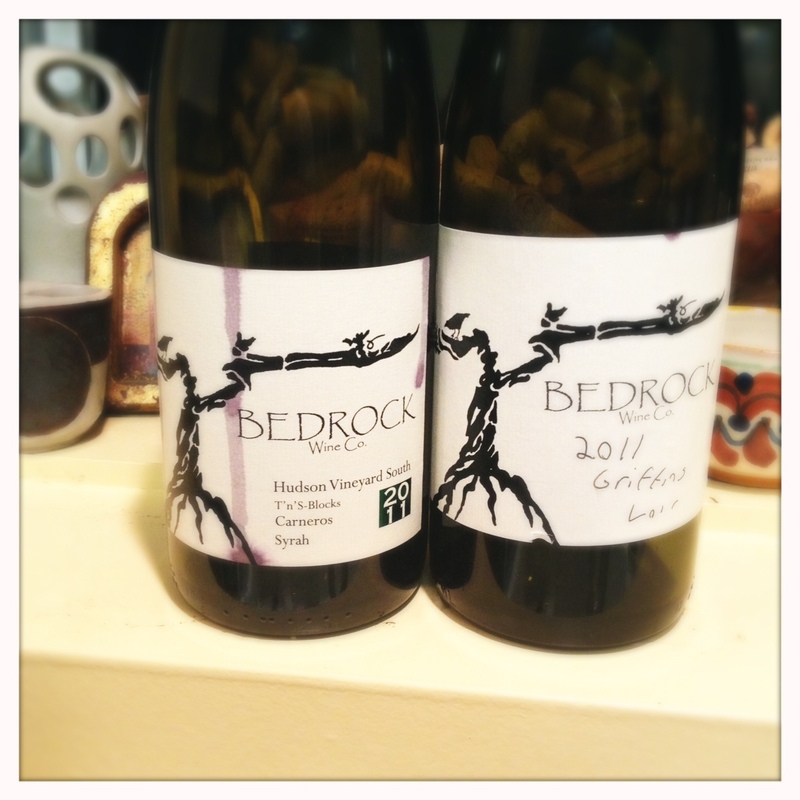 Bedrock gave me two Syrahs to try as samples from the 2011 vintage. First the 2011 Hudson Vineyard South T’ n ‘S-Blocks Carneros Syrah (in 2011 the S and T blocks of Hudson Syrah were blended together). Now, there was a time when this was one of the cooler-climate sites for Syrah in all of California. It’s now one of the warmer sites from which Morgan sources Syrah. There was also a time that Pinot was king in Carneros and now some (myself included) would say that it’s almost too warm to even grow Syrah there. This probably has less to do with climate change than it does with our changing view of what Syrah can be when grown in truly cooler climes. I practically grew up in Carneros working summers and weekends on a horse ranch and it was always pretty damn hot. Yes, foggy in the mornings but also really hot. As our view of cool-climate pushes closer the ocean, it will be interesting to see what will become of Carneros. As Pinot seems to be losing its footing in Carneros (although of course there are still spectacular examples) the emergence of Rhone varietals may be a possible version of the future. There’s a striking minerality on this wine. High toned aromas of gravel and pepper are there, alongside pure ripe plum and feral aromas of meat and blood. There’s a teensy bit of oak present but it’s nothing overwhelming. The mid-palate is weighty and rich but with good acidity to balance. Big tannins on the back end mean the wine could probably age forever. And if it’s any indication, I left this wine out on the counter with just the cork in for two days and it was still rocking. The tannins had mellowed and the wine was imminently more pleasurable. The 2011 Griffin’s Lair from the Petaluma Gap is a decidedly more elegant wine. The nose just simply smells delicious and inviting. Aromas of honeysuckle and sweet fruit just tell you to stop sniffing and drink a little. There’s a hint of savory green olives in the nose too just in case you were concerned that it might be too simple. The mouthfeel on this wine is all energy and lightness. It’s got a certain verve on the mid-palate that makes it super food-friendly, and the finish has a nice lift of acidity with some tannins. This is good stuff, and I think that, much like the Hudson, it’s going to be even more delicious in a few years when that acidity and tannic finish calms down. This wine is 60% whole cluster and has a whopping 11% Viognier added to it, which probably helps to round out the mid-palate a bit and give it a little more structure in what was an extremely cool year. I was extremely impressed with the overall quality of Bedrock’s wines and as fast as it’s growing and as much buzz as it’s creating it’s obvious I’m not the only one. I’m excited to see what the future holds for these two young and dedicated partners. These wines were provided as samples for review purposes. The West of West Wine event held in Sebastopol this year is one of the best wine tasting events offered in Northern California. It’s an event that celebrates wines grown in the true Sonoma Coast. Wines grown in the edge of their ability to ripen. The area has become a popular area for Pinot and Chardonnay to say the least, and as Jon Bonné has written in the San Francisco Chronicle, the region has even eclipsed the Russian River in its popularity and caché for Pinot Noir. The West of West event grew out of many winemakers’ frustration with the vastness of the Sonoma Coast appellation and a feeling like the wines made on the eastern edge (sometimes more than an hour drive from the ocean) shared little in common with the wines grown in the western, more coastal edge, of the appellation. They wanted to create a tasting that celebrated the wines that they felt represented truly coastal microclimates. I had a great time at the event this year. I’d been looking forward to this event for a while and even though it came on a weekend right in the middle of the start of a new school year in which I probably should have been in my classroom getting ready for Monday, I simply couldn’t resist. 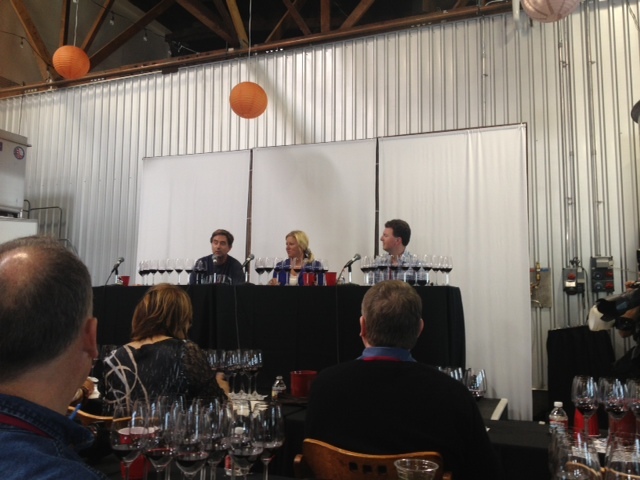 Adding to my excitement about the event was that they were offering a Syrah seminar this year. Now, outside of the Rhone Rangers events and the now defunct Hospice du Rhone event in Paso Robles, there just aren’t many seminars focused on Syrah these days. The Syrah from the Sonoma Coast are some of my favorite examples of the variety and I was definitely excited to try them, especially within the context of other Syrah from around the world in a blind tasting. I’d been curious for a long time to see how the “true Sonoma Coast” wines would stand up. The Syrah seminar was preceded by an interesting seminar on a newly approved appellation called Fort Ross Seaview, and as far as I know there’s no Syrah being made in this appellation so the morning pours were all Pinot. And what delicious Pinot it was. These were spectacular wines, the standouts for me were the 2010 Hirsch Vineyards San Andreas Fault Estate Pinot, the 2011 Flowers Camp Meeting Ridge Estate, the 2011 Red Car Estate Vineyard, and the 2011 Failla Estate Vineyard. You can check out Lily-Elaine Hawk Wakawaka’s excellent write up of this seminar on her site here. Now, on to the really good stuff: Syrah. The afternoon seminar was less well-attended than the morning one, perhaps one more example of how Pinot continues to draw the crowds these days. But the afternoon group, although smaller, was a livelier one and one with a star-studded panel: Ehren Jordan of Failla winery and ex-winemaker of Turley wine, Alder Yarrow of Vinography and Jancisrobinson.com, and Master Sommeliers Andrea Robinson and Gillian Ballance. Much of the discussion at the beginning of the tasting was about how Syrah has so many permutations, from ethereal cooler climate examples of the varietal with low alcohol to big, rich, bruiser wines that verge on having port-like texture and aroma profiles. The panelists described how cooler-climate Syrah is more savory, more red and blue fruit, higher acidity and minerality, with aromas of blood and iron and white pepper. And the warmer style is more juicy, verging on jammy with aromas of bacon fat, etc. None of this was really new to me but it was fun for me to hear these experts expounding on Syrah and it’s unique characteristics. Obviously this panel was a little biased towards to cooler side of the Syrah spectrum because the wine festival is a celebration of a cooler-climate growing area. Needless to say for someone with a blog on cool-climate Syrah who sometimes feels like a lonely voice in the wilderness, it was very exciting to hear some of the country’s foremost experts talk about Syrah in the reverent tones it so deserves. Wine number 1: Before the reveal, I had this wine pegged as a Cornas or St. Joseph, it was dark and brooding with a core of acidity and aromas of flowers, celery salt, and pepper. I was sure this was a Northern Rhone example at its finest. The reveal: Ehren Jordan’s own wine, the 2010 Failla Estate. What a wine; when we were told what it was the audience erupted in applause, apparently I wasn’t alone in liking this one. Wine number 2: I had this pegged as a warmer climate style, it was fuller with lots of blueberry fruit verging on jam on the nose, but the finish had a nice kick of acidity and tannin. The wine turned out to be the 2010 Gramercy Cellars Lagniappe Syrah from the Columbia Valley in Washington. Wine number 3: This was definitely a cool climate wine, a very light and elegant wine and I was thinking that it was French, St. Joseph specifically because of it’s floral nose. Again, I was pleasantly surprised as the wine turned out to be the 2010 Red Car Estate Syrah. Wine number 5: This wine for me was definitely old world, there was some funkiness to it. I did think it was warmer style though because of some overripe characteristics in the fruit. It was a blockier style of Syrah. The reveal: The 2010 Domain JL Chave St. Joseph. This was a surprising reveal for me. It think of St. Joseph wines as light on their feet and elegant and this wine was different. Wine number 6: This was a beautiful wine and we all expounded on its elegance and intriguing aromatics of pepper and olives mixed with berry fruit. Alder nailed it in the tasting as a California wine on the vanguard of the cool-climate Syrah movement. Because of that fruit coming through on the nose I first thought it might be a warm climate Syrah but the mid-palate had a huge hit of acidity that was anything but warm. The reveal: The 2011 Peay La Bruma. Another great showing for the home team. Wine number 7: This was a bigger and lusher wine, syrupy, and as Andrea Robinson mentioned, evoked memories of the berry syrup used at IHOP. I had it pegged as a new world warmer climate Syrah and it turned out to be true. The reveal: The 2010 Alban Patrina. Wine number 8: This was another big wine that was easy to tell was new world and warmer climate, big and juicy and almost port-like. Again this turned out to be true. The reveal: The 2011 Booker Estate Fracture. Probably the most expensive wine in the tasting. Not my thang. Wine number 9: This wine was a tough call, I went back and forth trying to decide if it was warm or cool-climate. In the end I decided to go with cool climate. The tasting group also struggled to figure out on which side of the warm or cool climate. This was another wine that people thought was old world. The reveal: The Baker Lane 2010. Again, another great Syrah from the true Sonoma Coasters. Wine number 10: This wine was also a hard one to call, in the end I guessed with new world, warmer climate. It was a meaty wine with some fruity and oaky elements. The wine turned out to be the 2010 Sonoma Coast Vineyards Syrah. The group also couldn’t decide if it was warm or cool. The wine did not quite stylistically fit into the same mold of the other WOW wines but it was a well-made Syrah. Wine number 11: Another bigger style of wine, fruity, smoky, new world style but with some savory elements. Juicy on the palate. The reveal: The 2010 Joseph Phelps Napa Valley Syrah. I liked this wine. I know, Napa? Am I jumping the shark? It was definitely not my usual style but it did have this nice core of acidity and some savory elements that I liked. Another example of how blind tasting is great because it challenges your expectations. I had a lot of fun at this tasting. And the biggest takeaway was exactly the one that the event’s founders envisioned: The tasting group thought all the wines from the WOW vineyards were delicious expressions of cool climate Syrah. And I agree, these “true Sonoma coast” wines were remarkable. My favorite for sure was the Failla Syrah but I also really enjoyed the Red Car Estate wine and the Peay “La Bruma”. The Failla and the Red Car are wines that I had not tried previously and I will have to search them out to explore more intently. The Failla has always been on my radar but I’ve stayed away because of the stiff price. I will shy away no longer. The Red Car was a pleasant surprise and as I was also impressed with their Pinots I’m going to have to get to know their wines better. I hope that WOW can convince at least a few more winemakers in the “true Sonoma coast” to plant more Syrah amongst the current Pinot explosion because these wines are stellar examples of the variety. WOW was a great wine experience and the Barlow event center was a perfect place for it. I would recommend it for anyone who’s really into wine, it’s well worth the price. 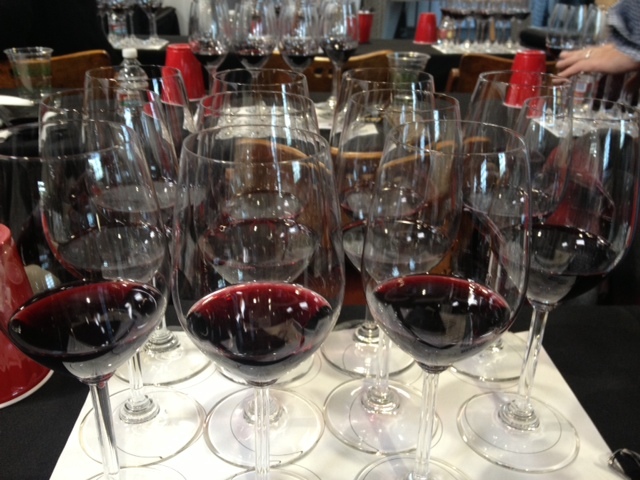 I also tasted a lot of really good Pinot both at the seminar and at the Grand Tasting. They all had a common thread of acidity that is Pinot as it should be. Classroom work or not, next year, I’ll be first in line to buy my ticket. And I can only hope there will be more Syrah. If not, I’ll kick back and enjoy another taste of incredible Pinot Noir.